To determine whether ceftazidime and imipenem, which target two different penicillin-binding proteins, result in different amounts of endotoxin and cytokine release in patients with gram-negative infection, plasma endotoxin, interleukin-6, and tumor necrosis factor alpha were measured during the first 24 h of antibiotic therapy in 27 patients with gram-negative infection who had been randomized to receive either ceftazidime 2 g t.i.d. (n=12) or imipenem/cilastatin 1 g t.i.d. (n=15). The source of infection was the digestive tract (n=13), the urinary tract (n=5), the respiratory tract (n=2), soft tissue (n=2), i.v. line (n=2), or other (n=3). After the first antibiotic injection, a significant increase in the median concentration of plasma interleukin-6 and plasma tumor necrosis factor alpha was noted, without significant differences related to the antibiotic administered. Antibiotic-induced endotoxemia was detectable in nine patients (including 7 with bacteremia). 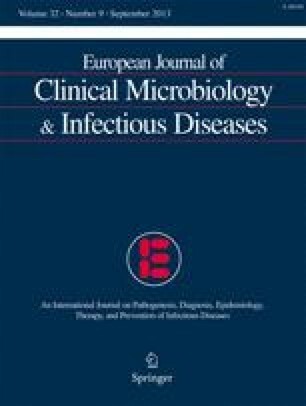 In conclusion, ceftazidime and imipenem had similar effects on endotoxin and cytokine release during the treatment of gram-negative infections.